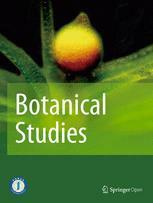 Encompassing all aspects of botany, Botanical Studies publishes high quality articles across a wide range of plant biology, including but not limited to morphology, development, genetics, evolution, reproduction, systematics, and biodiversity of all plant groups, algae, and fungi. Botanical Studies is affiliated with the Institute of Plant and Microbial Biology, Academia Sinica, Taiwan. Served by a well-established Editorial Board, the journal provides authors with quick editorial decisions and attracts a large readership from around the world.